Nosy noble nabs bold bluestocking. Yes, of course Lady Emma Cavensham finds Nicholas St. Mauer attractive—she even kissed him once—but that doesn’t mean she wants to marry him. Or anybody, for that matter, since none of the men of the ton are “able or willing to accept a woman as an equal partner.” Nick’s interference three years earlier, when she tried to purchase a rare copy of Bentham’s Essays, led to her parents removing her from society. And in any event, her only goal in life now is to prove that her best friend, Lena, died not from an accident, but at the hand of her abusive husband. However, after her vengeful return to London, it’s not long before Nick intrudes again, when Emma’s quest comes close to the border of impropriety, and this time, his meddling leads to a forced betrothal. Though they both accept their fate, Nick’s long estrangement from his father, the Duke of Renton, and Emma’s desire for the freedom of spinsterhood mean both are reluctant to abandon their prized solitude—even in the face of their powerful attraction. 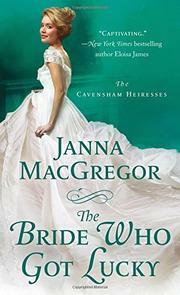 The second title in the Cavensham Heiresses series again proves that MacGregor has a real talent for developing every facet of a romance; it can be read independently from the first book, but readers of one will devour the other. In steamy scenes as well as emotional ones, Emma and Nick develop not just as a couple, but also as individuals, each thanks to the other’s affections. After a lengthy buildup of tensions outside their love story, some readers may find the ending somewhat abrupt, but all will be glad to see the protofeminist couple reach their happily-ever-after together—and as equals. An independent-minded lord and lady find comfort in each other rather than Regency society.